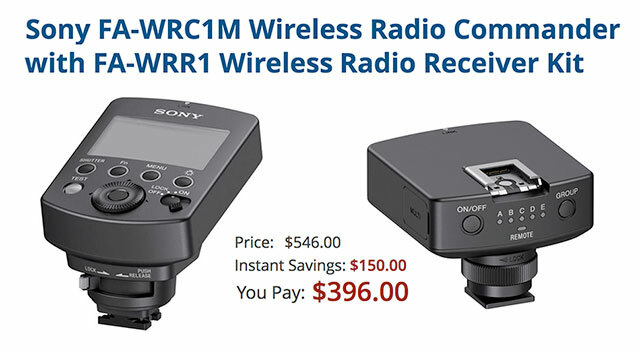 Save $150 on Sony FA-WRC1M Wireless Radio Commander + FA-WRR1 Wireless Radio Receiver Kit with Limited Time Offer! 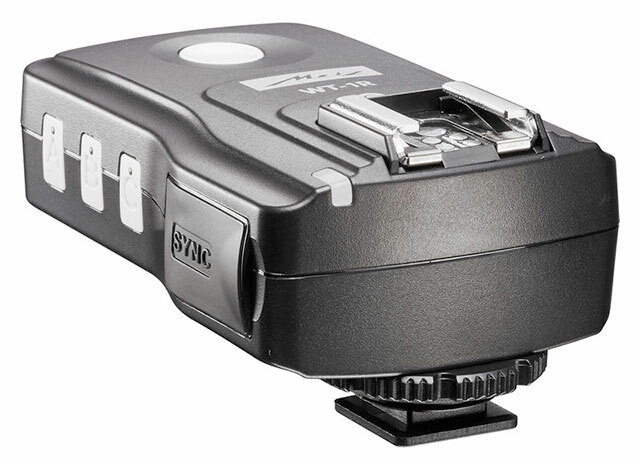 Featuring a Multi Interface Shoe on the top, this receiver will directly support most Sony-compatible flash units and will even work in manual mode with flashes that use the Auto-lock Accessory Terminal along with an adapter. For full functionality a flash with the Multi Interface Shoe is required, enabling TTL and High-Speed Sync support as well as all remote control functions via the FA-WRC1M Wireless Radio Controller or a compatible radio-equipped commander flash. In order to ensure reliable performance, the system uses a 2.4 GHz radio signal with a range of up to 98.4′. Also, it can operate on one of 14 channels and with up to 5 groups. In addition to a flash connection, the receiver offers a standard PC sync terminal for connecting to alternative strobes and lights. There is also a Multi Terminal connection for remote triggering of select cameras with the use of the separately available VMC-MM1 Multi Terminal. 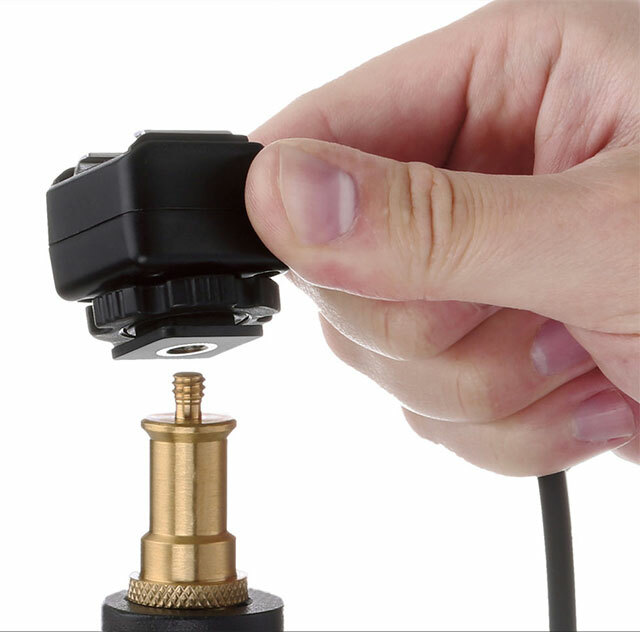 For mounting the flash setup to a stand, the receiver features a cold foot on the base with a 1/4″-20 thread. Additionally, it is dust and moisture resistant for operating in less-than-ideal environments. Metz WT-1 Wireless Trigger Kit (Transceiver + Receiver) for Sony ($209.95 at B&H Photo) allows you to create a long range wireless flash setup with your Sony ADI / P-TTL system. This Wireless Trigger Kit bundles together a transceiver and a receiver, the essential pieces to a remote flash setup, which use a 2.4 GHz frequency to achieve a maximum range of 984′. The setup also permits full TTL transmission, including high-speed sync, as well as manual control. Metz WT-1T Wireless Transceiver for Sony ($139.95 at B&H Photo) uses a reliable 2.4 GHz radio signal and a selection of 15 channels, to trigger receivers up to 984′ away, without requiring line-of-sight and with minimal interference. This system is compatible with Sony’s ADI / P-TTL flashes, permitting both TTL and manual control options and support for high-speed sync at up to 1/8000 second. Users will even have access to a TTL pass-through hot shoe on the top for using a flash directly on camera or setting up this transceiver unit as a receiver. When multiple flashes are involved, the WT-1T offers group control with three groups for creating more elaborate setups. It also has a backlit LCD screen to show and change current settings as well as a standard sync port for use with studio strobes. It has a USB connection for firmware updates. 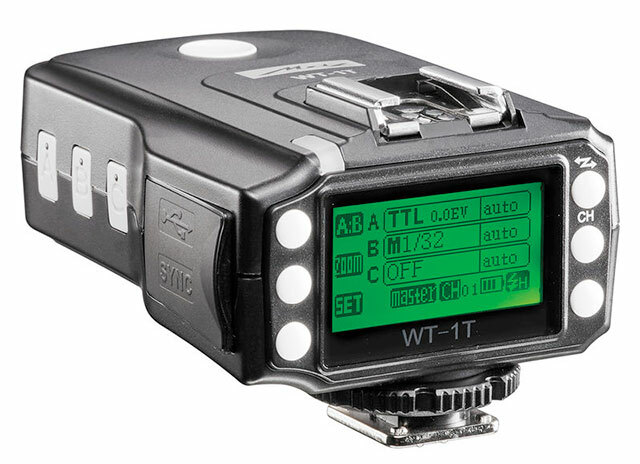 Metz WT-1R Wireless Receiver for Sony ($74.95 at B&H Photo) is designed to support Sony’s ADI / P-TTL flash system. This 2.4 GHz receiver will operate at distances up to 984′ while transmitting full TTL information. Also, by using a radio system you can position flashes without needing to worry about maintaining line-of-sight with a trigger. Other benefits of this system are options for manual control as well as high-speed sync support at up to 1/8000 second. Additionally, it has a top hot shoe for mounting a flash as well as a standard sync port for working with studio strobes. It is easy to mount as well, featuring a locking foot with a 1/4″-20 thread. 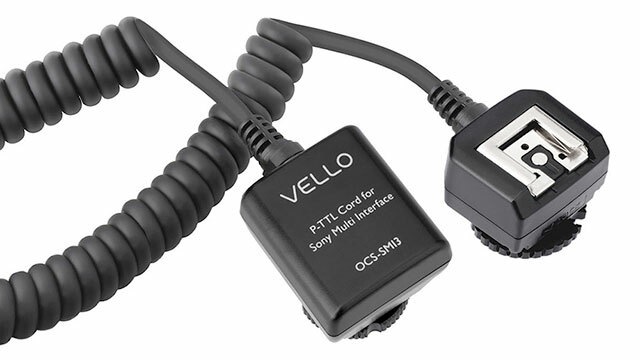 If you’ve been Searching for an Off-Camera TTL Flash Cord for Sony Multi Interface Shoe Cameras & Flashes – Your Search is Over! 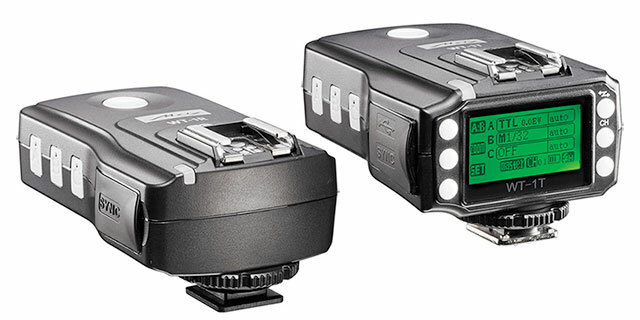 Broncolor RFS 2.2 Transceiver ($114.95) offers HyperSync (HS) with Broncolor Siros L and Move flashes for Sony, Canon and Nikon cameras. As others have pointed out, this appears to be re-branded Godox X1 Transceiver that’s been modified and customized for Broncolor for control of Broncolor Siros L and Move packs. Probably using the same hardware, but Godox commanders can’t control Broncolor flash and this commander can’t control Godox speedlights. It offers the user a bright illuminated LCD screen which is easy to read and clearly indicates all settings. The RFS 2.2 transceiver is compatible with all Broncolor power packs or monolights equipped with an RFS 2 or 2.1 interface – but the HS function is available only for Siros L and Move flash units. 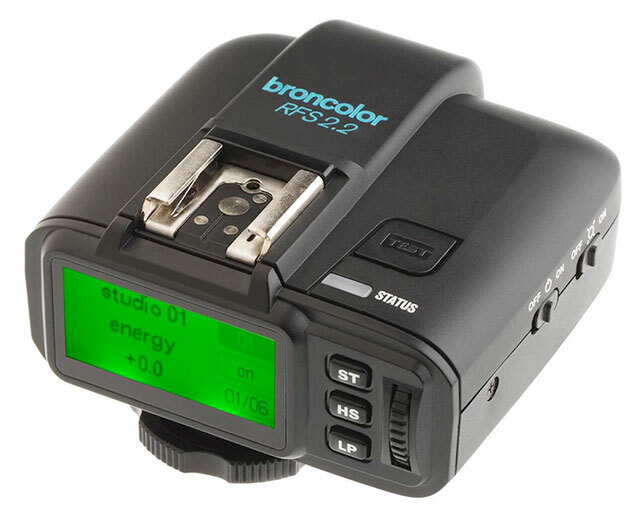 The Broncolor HS function lets you now use flash in combination with very short exposure time settings on your camera. Advantages include allowing the photographer to use a high shutter speed (up to 1/8000s) to freeze motion, overpower the sun with less flash power and equipment, darken backgrounds using a high shutter speed, and most importantly shoot with a large aperture creating shallow depth of field. 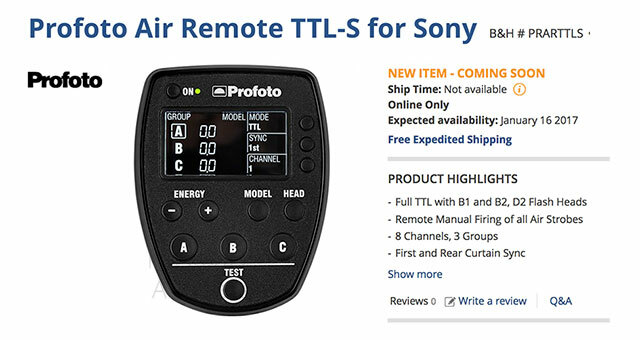 Profoto Air Remote TTL-S for Sony Available Now! 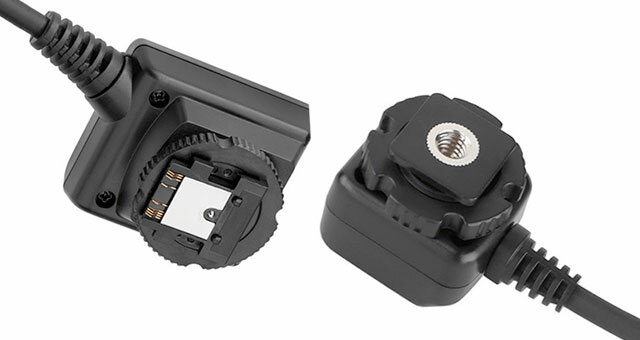 Profoto Air Remote TTL-S for Sony Multi Interface shoe cameras offers full TTL and HSS capability with Profoto D2, B1 & B2 flashes. It’s compatible with Sony a7 II, Sony a7R II, Sony a7S II & Sony a99 II. • Sync Speeds as Short as 1/8,000 Sec.